By: Beth Anderson on January 9, 2018. No doubt about it, makeup can be quite expensive, particularly the high-end European designer brands. Therefore, it comes as little surprise to find an entire industry selling used makeup online has mushroomed. Hey, it’s the best of all worlds. You get killer cosmetics at a reduced price, someone else gets a bit of cash back from all the makeup they have lying around unused and a merchant gets paid for putting the two of you together. But you might also get something you didn’t bargain for—which is why buying used makeup is a bad idea. The biggest problem with buying mascara and eyeliner used is the contamination factor. Previously used and shared oil-based and water-based eye products can harbor Conjunctivitis. Commonly known as Pink Eye, this disease is extremely contagious, and people don’t always know they’re brewing it. Then, there’s the bug scientifically known as Pseudomonas. An infectious bacterium, this is of significant concern because it loves to grow in a warm moist environment. When exposed, your eye becomes like an incubated Petri dish for the bacteria as you sleep at night. Pseudomonas can leave behind corneal ulcers when it feeds on your eye tissue, which can result in blindness. So yes, you do get pretty eyes, but with no vision. Nail polish, on the other hand, is probably OK, if it is in good condition and not clumping. From a disease perspective, nail polish is rather benign, even though it is oil-based like lipstick, mascara, and eyeliner. The saving grace of nail polish is the solvent upon which it is based. Highly toxic to bacteria, nail polish has the advantage of being somewhat self-sanitizing. 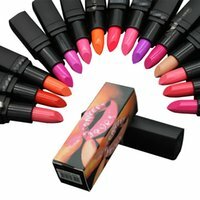 If you’re thinking to sell makeup from home online, this is a product you can feel confident offering. Purchasing used lipstick can be a great deal, as long you don’t mind putting yourself at risk for Herpes Labialis — also known as Cold Sores. The underlying herpes simplex virus loves to live in oil-based products like lipstick, Chapstick, and lip-gloss. In fact, you probably want to think twice before sharing these products with people you know—let alone buying them from strangers. This situation is particularly dangerous because people who have it might not even know they do. It’s possible to have a case of herpes, be infectious and be totally unaware of the fact. The virus travels along nerves to reach the surface of the skin. In some cases, this can happen with no physical symptoms. Buying used lipstick is just too risky. Blushes, compacts and finishing powders are usually OK because they have no warm moisture within which viruses and bacteria can thrive while waiting for a new host. With that said, these products get a “Probably OK,” because there is a very slight possibility oils from the previous user’s skin can be transferred to the powder from the application brush. However, also working in their favor, is the fact these products tend to be applied to less disease-prone areas, such as the forehead, cheeks, neck, and chin. Many people think you can sanitize oil-based products with alcohol. However, alcohol typically only treats the surface. But the infectious agents in question tend to live inside the products. Further, while you can disinfect a mascara wand, every time you dip it in the product it would get infected again. So, in most cases, buying used makeup is just a bad idea. You’ll look great—but you could wind up feeling lousy.